It's the RIGHT time of year to share some tips for helping children discriminate their right and left hands. Focus on the right hand because then what is “left” over will be their left. Let children make bracelets out of pipe cleaners and wear them on their right hand. Throughout the day call attention to their right hand…right ear…right leg…right foot, etc. Rub lotion or scented lip balm on each child’s right hand. Trace around your right hand on construction paper and cut it out. Place it near the flag so children can visually match up their right hand and then place it over their hearts. Which is my left? Which is my right? Left from right, left from right. Hurray, now I can tell! Here is my right hand way up high. Here is my left hand touch the sky. Right and left and roll out of sight. Now I know my left and right. Note! Hand dominance is established when either the right or left hand is consistently used for writing, eating, or throwing a ball. Most experts claim hand preference begins in preschool years and that by kindergarten there is a preferred hand. I studied Bloom’s Taxonomy in graduate school 4 decades ago, but it’s as valid today as it was in the 70’s. Benjamin Bloom developed a hierarchy of assessing thinking that gives you insight into the student’s processing and depth of understanding. Level One: Knowledge – Ask students to identify and recall information. Level Two: Comprehension – Ask students to organize information or put it in another form. Level Three: Application – Have students use facts, rules, and principles. Level Four: Analysis – Ask students to break information into parts. Level Five: Synthesis – Invite students to compile information in a new way. Level Six: Evaluation – Ask students to develop an opinion or make judgments. Many times when teachers are evaluated they are criticized for not using higher order questions. I’ve created these prompt cards that may help you improve in this area. You can download them and then cut out the ones that are most appropriate for your grade level. Glue them to index cards, punch a hole, and attach them to a book ring. *Hint! Color code the different levels. For example, you could outline level one questions with a green marker. Outline level two with a blue marker, and so forth. Have you ever heard of the 20-80 principal? About 20% of your effort at something yields 80% of the results. In other words, you can teach smarter doing some simple things that can impact learning in a big way. 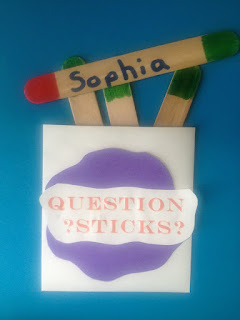 You might want to try one of these questioning strategies each day and then reflect on the children’s responses. Thumbs Up Thinking – Tell children to stick up their thumb next to their chest if they have learned something. Stick up fingers for each additional thing you’ve learned. Sign Language (Yes/No) – Teach children the signs for “yes” (wiggle fist in the air) and “no” (touch index and middle finger to thumb like a mouth closing). You can also use cards with “Yes” and “No” written on them. Engage All Students - Call on students who raise their hands as well as those who don’t. 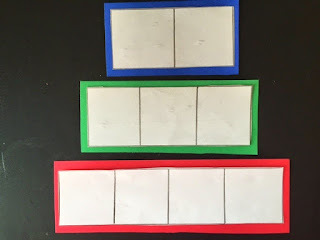 KWL – Know, Want to Know, Learned – When introducing a new theme or concept make a list of what the students already know about the topic and what they want to learn about the topic. During the study they can be encouraged to write what they are learning. *KWL can be done as a class or individually. One of the most powerful teaching strategies isn't something you buy or plug in. It's the ability to ask GOOD questions that make children think. Over the next few days I'll try to give you some practical tips and strategies. How did you know that? Encourage children to “think out loud.” This will help peers develop higher thinking skills. Give Time (Smile! J) – Help children think about what they want to say and provide for individual differences by asking children to smile if they know the answer. Allow at least 3-5 seconds of think time. Pause – Pause a few seconds after students have responded. This may encourage them to think more deeply or to elaborate. Come back tomorrow for some specific strategies that are easy to implement and could have powerful results! How about some new ideas today? It doesn't take much to make me happy. Just looking through old files of ideas and finding gems like these makes my day. And, I hope you'll find something here to make your day! Sure am glad you came today. Before you go, what do you say? Hug, handshake, or high-5 today? *Children choose if they want to give the teacher a hug, handshake, or high-5 before they leave the classroom. 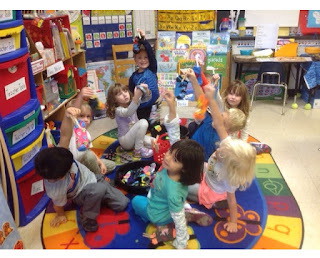 “Sprinkle” kindness (hands up and wiggle fingers) on the Star of the Week, Birthday Child, or for other occasions. When children see friends in the hall teach them to do the hallway hug. Open your arms as if giving a huge hug in the air. *This is good for when students see a friend in the hall. *This is also good when someone comes in or leaves the classroom and the kids want to jump up and give them a hug. 5th - Walk away happy! If children talk ugly to a friend, then tell them to go talk like that in the mirror and see how it feels. TEN THINGS ADMINISTRATORS NEED TO KNOW! I'm getting on my soap box today. It breaks my heart to hear stories from teachers about how frustrated they are. I thought I might help you by giving administrators a little advice. What do you think about my list? Would you like to add something to it? How can we "hold hands" and make your job more enjoyable and satisfying? O.K. I admit that I’ve never been an administrator. I know that the expectations of the job are beyond what any person is capable of doing. However, I’ve been at this rodeo a long time and administrators and educational decision makers need to realize that there is a CRISIS now! Teachers are the heart and soul of our schools and they are stressed, burned out, frustrated, and depressed. In other words, TEACHERS ARE GETTING BEAT UP! Beat up with paperwork, assessments, evaluations, criticism, and lack of support. It makes me sad as I travel across the country and listen to classroom teachers. Teaching used to be a lot more fun. We got our class list, shut our door, and did our best to help our children learn. I enjoyed going to work and one of my major goals was to have happy students who loved coming to school. If teachers aren’t happy, how are children going to be happy. And, at the end of the day, isn’t that what life is all about? Based on teachers’ comments, here are some suggestions I’d like to offer administrators and educational decision makers. 1. Let your teachers TEACH. Give them autonomy to do their jobs and TRUST them to do what’s best for their students. 2. If you’ve never taught the grade level, you should NOT make skill lists or set expectations. 3. Support your teachers. Be careful not to let a single parent’s request sway what’s best for their child and the other children in the classroom. 5. The word “rigor” is not appropriate when talking about instruction for young children. The world keeps changing, but children are still children. They don’t all grow up in the same way at the same time, and they should not be expected to accomplish skills according to some master plan. 6. Please don’t give teachers any more paperwork. Assessment and reports are driving instruction and consuming their day. 7. Teaching is a video not a snap shot. Is it fair to walk in a classroom, observe for 10 minutes, and then make negative comments to the teacher? Compliment teachers for what they are doing well. Give positive suggestions instead of critical remarks. 8. Be a real person and a good model for your teachers. Visit each classroom and do something FUN by reading a book, teaching a song, telling a joke, or doing a magic trick. 9. Don’t take away their JOY! If the children are engaged and enjoying an activity, do you have to ruin it by requiring “observable evidence”? Let it be! It’s O.K. to read a book without dissecting it with questions about the author’s purpose. It’s O.K. to take a walk outside to enjoy the peace and beauty of nature. It’s fine to sing a song or use a brain break to make children smile. 10. Remember that for some of your students “school” is as good as it’s going to get for them. You never know what’s going on at home, and school should be a wonderful world where they feel accepted, successful, and excited about learning. TEACHERS WHO LOVE TEACHING MAKE CHILDREN WHO LOVE LEARNING! WHAT CAN YOU DO TO HELP YOUR TEACHERS LOVE THEIR JOBS? I was thrilled with the book my friends shared with me in Bowling Green last week. If you’ve never read THE DOT by Peter Reynolds you can find out more about it by visiting www.thedotclub.org. I think we’ve all had experiences similar to Vashti where we think, “I can’t draw.” “I can’t sing.” “I can’t dance.” “I can’t do statistics.” “I’ll never be able to cook.” Etcetera, etcetera. The book is a beautiful lesson for children about just getting started and TRYING! THE DOT also reminded me of some simple art activities we can do with our students. These activities are open-ended and can be used with any age or integrated with a unit of study. Directions: Give each child a sheet of paper and a sticky dot. Ask them to place the dot anywhere they’d like on the paper. Next, challenge them to create something out of the dot. Directions: Children roll the dice and add up the dots. They take a black crayon and make that number of dots randomly on a sheet of paper. Can they connect the dots and create something out of it? *Have children make dots and then exchange papers with a friend. Directions: Cut a hole out of the middle of each sheet of paper. Ask children to look at the hole and then create an object out of it. *Extend the activity by having children write about their pictures. Directions: Have the children close their eyes and make a design on their paper with a black crayon. When they open their eyes, have them turn their paper all around and try to create something out of their design. *Have children exchange papers of wiggles and squiggles with a friend. My friend Pat Gusoff sent this idea that she did last week. Talk about WIN/WIN!! 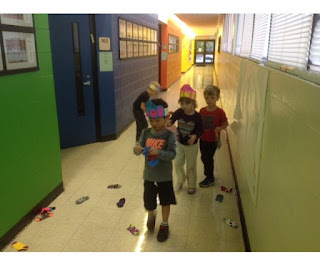 Children learned math, developed small motor skills, had fun, and helped others! I'm only sharing this with you as an idea of what small hands and big hearts can accomplish! Thanks for being there so I can share with someone who continues to care! And thanks to all of you for visiting my blog so we can keep sharing as we pass on the torch to other teachers!!! Someone recently asked if anyone had a book about a hurricane. I wasn’t familiar with a book about a hurricane, but I decided to adapt my “Rainhat Story” to make a positive twist on a frightening experience for children. Hope you’ll enjoy sharing it with your class. Here’s a link to the original “Rainhat Story” so you can learn how to tell it. It’s one your children will want to hear over and over again. See you at Five this afternoon! Say a series of words that begin with the same sound. Say one word that does not begin like the others. Children listen and identify the word that does not belong. Think of adjectives for the days of the week and months of the year. For example: Thrilling Thursday or Marvelous May. Sing “Pepperoni Pizza”, “Bubble Gum”, and other songs where alliteration is emphasized. *Use this song for other consonants and vowels. them. Substitute other consonants, blends, and diagraphs in this song. but PLAY ideas on Wednesday. Don't be late - see you at FIVE! Clap, hop, walk, or nod the syllables in children’s names and classroom objects. Disco, hula, swim, or march to syllables in rhymes and songs. Slowly clap hands to the beat as you say the chant below. *You could also let them show the number of syllables by placing the appropriate number of poker chips or popsicle sticks on their desk. Bend in your fingers and extend your thumb. Going from the left tap a finger for each sound with your thumb. Phonological awareness is the ability to recognize sounds in oral language (rhyme, alliteration, syllables, etc.). Children must first hear the sounds before they can relate them to letters (phonics). Let's start today with rhyming. Learning to rhyme doesn't happen it one lesson...it takes a lot of oral language (nursery rhymes, finger plays), songs, books, and games to help children develop this skill. Tell the children that they will get to be detectives andlisten for words that rhyme. You say a word, and they put their pinkies up if they hear a word that rhymes with it. Pinkies down if it doesn’t rhyme. Have children extend their arms as they say pairs of words that rhyme. 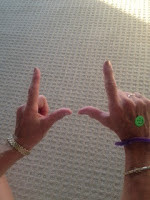 For example: sun (extend right hand) - fun (extend left hand). As they progress, the teacher says a word as children extend their right hand. Cut paper plates in half using puzzle designs similar to those shown. Glue pictures that rhyme on each half. Mix up the pieces. Children say the words and match up the plates that rhyme. The game is self-checking because the pieces will fit if they match the correct pictures. 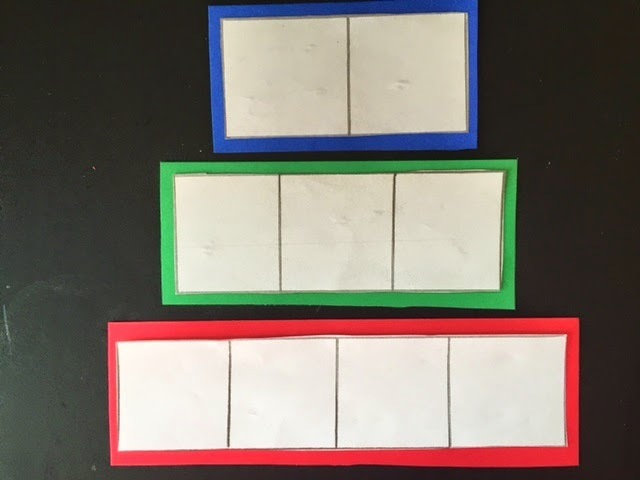 *You can also use season shapes to make a rhyming game. 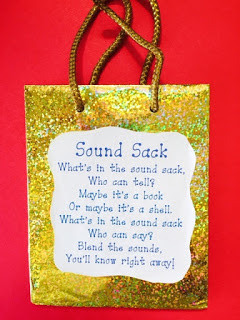 Give each child a lunch bag and for homework ask them to bring two objects that rhyme. As they take turns sharing their items encourage classmates to think of other words that rhyme with their objects. and maybe even a little more!! LET'S MAKE A HAT TODAY!